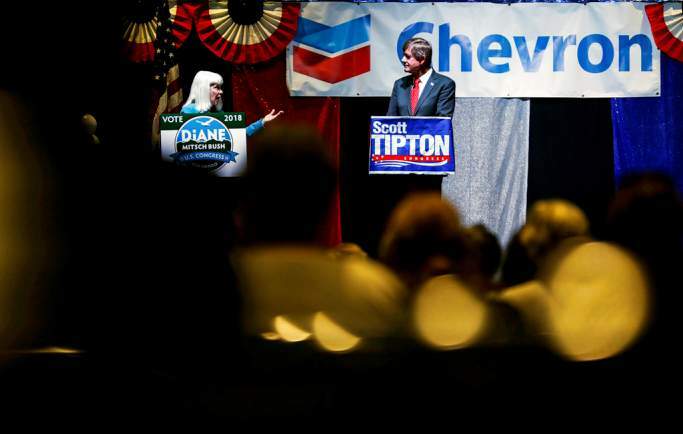 Democratic candidate for 3rd Congressional District Diane Mitsch Bush, left, and Republican Congressman Scott Tipton, right, speak during the Club 20 debates at Two Rivers Convention Center on Sept. 8 in Grand Junction. Democrat Diane Mitsch Bush appears to be gaining traction in her bid to unseat Republican U.S. Rep. Scott Tipton in Colorado’s sprawling 3rd Congressional District. The national election forecast blog FiveThirtyEight on Tuesday ranked the race as a toss-up between the two candidates, a shift from the safe lead that incumbent Tipton enjoyed late last month. The district encompasses nearly half of Colorado, including the Western Slope, the San Luis Valley and the Pueblo area. Tipton is seeking his fifth term as its congressman. FiveThirtyEight now projects Tipton has a 55.8 percent chance of retaining his seat to Mitsch Bush’s 44.2 percent chance of winning the election. Others, however, doubt that Mitsch Bush has the momentum needed to flip the largely conservative 3rd District, which has largely favored Republican presidential candidates in the last three elections. Among those doubters, of course, are the members of Tipton’s campaign, who portray Mitsch Bush as a far-left crusader. “We are confident Scott will defeat a radical extremist who actively funded a socialist magazine that equated our troops with terrorists after the 9/11 attacks,” said campaign spokesman Matt Connelly. Mitsch Bush previously acknowledged that she had subscribed to In These Times, a left-leaning magazine based in Chicago and founded by a former member of the Communist Party. She said she subscribed in order to broaden her worldview and denied claims that she actively funded any anti-American sentiment. Macys said campaign staff will take a few minutes to celebrate gaining ground, but then they’ll go right back to knocking on doors and reaching out to potential voters. Despite what some regard as the tightening of the 3rd District race, most observers continue to see the race in suburban Denver’s 6th Congressional District between incumbent Republican Mike Coffman and Democratic challenger Jason Crow as the most hotly contested in the state. FiveThirtyEight currently gives Crow an 83.8 percent chance of winning the race, but others note that Coffman – who won in 2016 despite his district supporting Hillary Clinton over Donald Trump – has repeatedly beaten off challenges from formidable Democratic opponents in the past. FiveThirtyEight projects the remaining five congressional races in Colorado to strongly favor either the incumbent candidate or the incumbent party.